20.10.2010 Updated code to add some more features: Edit list properties: “Hidden”, “ShowUser”, “Ordered”, “Direction”. 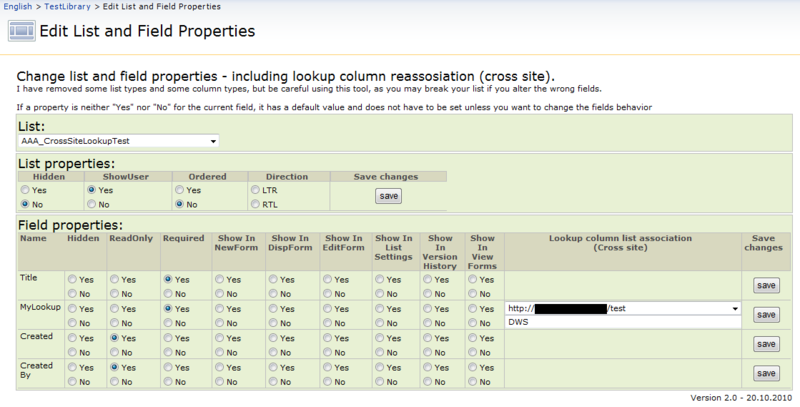 Field properties: ShowInDIP (document information panel) and cross site lookup functionality for a standard SharePoint lookup column. The article is updated and describes the changes. Hidden: Hide the list so that it does not appear on the Documents and Lists page, Quick Launch bar, Modify Site Content page, or Add Column page as an option for lookup fields. ShowUser: Specify that names of users are shown in “Created by” and “Modified by” fields. Ordered: Specify that the option to allow users to reorder items in the list is available on the Edit View page for the list. Direction: LTR if the reading order is left-to-right, RTL if it is right-to-left. Hidden: Specifies whether the field is displayed in the list. ReadOnly: Specifies whether values in the field can be modified. Required: Determines whether the field requires values. Show In NewForm: Specifies whether the field is displayed in the form that is used to create list items. Show In DispForm: Specifies whether the field is displayed in the form for displaying list items. Show In EditForm: Specifies whether the field is displayed in the form that is used to edit list items. Show In DIP: Specifies whether the field is displayed in the “Document Information Panel” in compatible Microsoft Office applications. Only available for document libraries. Show In List Settings: Specifies whether the field is displayed in the page for customizing list settings. Show In Version History: Specifies whether the field is displayed in the page for viewing list item versions. Show In View Forms: Specifies whether the field is displayed in pages that are used to view list data. Lookup column web and list association (cross site lookup): Change the web and list association for a lookup column – Note: If you do this, all existing elements in this column will be lost. The cross site option is only available for site collection administrators! I have removed some list types and some column types, but be careful using this tool. Test this in a “test list” before you use it in your “production environment”. If you edit the wrong field, you could break the list. Use this tool at your own risk! Create a WebPartPage, insert a CEWP, and paste the code. WOW, this is some powerful piece of code! Superb piece of coding and nice work !!! Thanks and I will defintely test it. this is exactly what i need and searched for the last week. But unfortunatly it doesn`t work. I checked the path to the jquery file and it is correct, it also shows the changed column green when i click on the Save Button. But the changes doesn’t seem to be saved. I selected a field in a Tasklist not to be shown on DispForm, but it is still there. I use WSS 3.0 to test this. A bug… i had the wrong propertyName for “ShowInDisplayForm” – Code updated, thanks for spotting it!. Look at the developer console (hit F12 > Console) – any errors? – maybe missing link to jQuery? As always, you have created an amazing piece of code! I have this code working as advertised except I am experiencing the diappearance of anything I set to ReadOnly. This behavior is by design. This is “standard SharePoint behavior”. Your code is some of the only ones I have found that WORK! My apologies if I am wasting your time, but I am afraid I do not understand the ReadOnly working the same as Hidden. Can the ReadOnly be changed to Display only. For example I want users to SEE the fields contents but I don’t want them to be able to edit it. I am hoping that it could perform what the code below achieves. Code updated to support editing of the “Title” field. Small fix regarding showing the title field. Changed the field name to “DisplayName”. Fantastic! Is it possible to use this to “Show in Alerts”? I haven’t been able to find anything to help control the appearance of alerts and my html calculated columns show up there and look terrible. Thank you for all that you do! Terrific Job, It is one of the best post. Can you please let me know how can i hide or remove Title, All Day Event, Recurrence, Workspace fields from Calendar. I dont want this feilds to show up in any of the forms i.e new, dispform, allitems, edit. I really appreicate if you could quickly post some solution to it. Hi, Server side code is no problem to use if you have access to the server. In *most cases* the end user does not have access to put files on the webserver. plz tel, will i have to put it in sharepoint designer? No need for SharePoint designer, just put the code in a CEWP in a webpartpage. Thanks for sharing the great script. A quick Query: Could you please tell me how to only display my own lists? how do I get the number of my list as you written in script? These are not lists, but list types. I’m not sure what you mean by “your own lists” as the list does not have any records of the user who created it. Great script. Can you advise why Calculated Field type do not show? I’m using some Text2HTML stuff and I don’t want fields like ‘Color’ to show up. I’m having to edit the forms individually to hide the field and it would be good if I could manage them through this script. Look at line 213 in the script. If you remove “Calculated” from the “arrOfTypesToSkip” you will see your calculated fields alongside many “system fields”. You better not change the “system fields” as you can end up messing up the list for good. Thank you so much for your solution! I have been scraching my head for a while now and found this… Amazing!!! I do have a question: Once I set a field to “read only” it is not listed in edit mode. Is there a way around that? gud article. i have one query like there are 2 users ie user1 and user2. and user 2 should have to enter or eidt abc. is it possible? Please suggest how to do it. This is a power user / site collection administrator tool, but if the user is not site collection administrator, setting the list permissions might work (if xyz and abc is lists). Does it work on SharePoint 2010? Yes, the field-properties part does. will this allow me to create a lookup column on a subsite and bring that to a form on the parent? I created a test list. It looks like it will let me pick a subsite. But nothing has changed on my test list. Is there some other step I’m missing? It’s a brilliant bit of code. Unfortunately in SP 2010, you set a field to read only and display in editform, and it no longer appears in editform. Seems like an SP bug to me. So all I could do was make a new edit form (which is detached sadly – won’t reflect future column changes) then edit the field settings in SharePoint Designer. This is the default behavior for a read only field. This tool adds nothing more then the ability to toggle the already existing (but hidden) attributes for the fields. This solution either hides or shows the field. You should look at some other solutions in stead. It says timeout error for any browser. How i can grab your code? I have updated the link. The redirect from my old server was down. i want to hide some columns in edit view. This code will do that for you – are there any problems? This is freaking cool. Thanks for posting. I was trying to set the Hidden property to Yes for several system created Libraries like “Site Collection Documents” and “Site Collection Images” which are part of the “Publishing Resources Feature” and I get an Error Occured response from the script. Is that expected? Thanks! Sorry for the late reply. I’m not familiar with the “Publishing Resources Feature”, but it might be that these columns are not editable. I’ve tried to implement your solution, but get “Web selector not available” in the ‘lookup column list association’ column, so can only choose a list on the same site collection. Any idea what is causing this and how, if at all, I can fix this? PS I don’t have access to the server. Thanks. Is this on SP2007 or SP2010? Thanks for looking at this. We use SP2007. I’ll post a new “lookup relinker” solution later tonight. Great solution, we used it in our SP project a lot, but now we moving to SP 2013, any plans for SP13 support? Have you tested it? – I have not tested it myself as I do not have access to a SP2013 site yet. WOW! You deserve a medal. Great job! Next, I saved the script as EditFieldProperties.js file onto my computer and uploaded it to a document library on our SP site called Site Assets. I then referenced the path from the Site Assets library in the CEWP, and all that happend was a link to EditFieldProperties.js appeared on the CEWP. I am sure it is some newbie thing I am missing. So any further detail would be greatly appreciated. You must put the code in the source editor, or link it using the “Content link” option in the CEWP. I suggest you use the HTML Form web part as this has a source editor only. Thanks Alexander! The HTML Form Web Part actually worked. I do not think this will fix your problem, as this column is not set as required by default. Please be careful, you might break your list. Thanks Alexander! I will try that and be extra careful. I am not sure either why or even how the “Modified By” column was set to “Required”. Any thoughts? In my search for an answer, Google has brought me here. Any other less riskier ideas or solutions. I tried changing the Manage Content Type to “Yes” within the list’s Advance Settings and change the property there… but no such luck. When I open the list’s form in InfoPath, I still see the field as having a red asterisk for required. Saving a new record is impossible because the required constraint is being violated. So, I am desperate. Out of curiosity, worst-case scenario, how might a list be rendered broken by the changes made by the script? Greate solution Alexander! You have done a great job here! I will have to redo it in not so distant future, but I cannot be more specific. Great job! I recommended it a lot. I haven’t tested full functionality but column properties are working. Obviously SP2013 specific properties are no available. I’m trying your script in SharePoint 2013. I’ve added a CEWP to the default new form and added a link to the JS file (in site assets) in the content link and I can click to load list collection and all I get is please wait while loading lists. I did replace the two enteries _spUserId with _spPageContextInfo.userid. I used Script Editor to insert the script into the page and that worked for me. Hi Alexander, Im on SP 2013 and i put a reference to the code in a CEWP but there’s no lists on “select a list to start”.